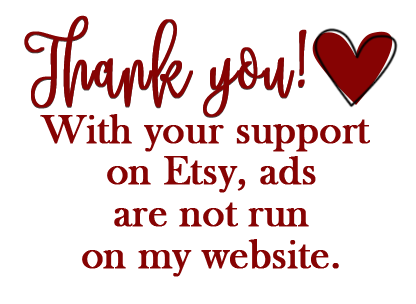 So I think I've gone a little overkill for this sharing time with a whole bunch of information but I hope that you can pick and choose and you can find some help. For this lesson, I really wanted to show that even when there were temples in biblical times, the Lord was behind each one and that each is built by the direction of Jesus Christ. 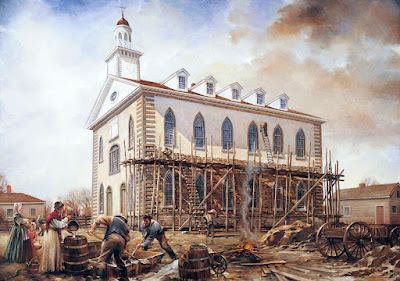 I've included links for the Tabernacle during the time of Moses, Solomon's Temple, Nephi's temple in Bountiful, and the Kirtland Temple. You can also add your own area's temple with facts about it. Ex 31:18 ¶And he gave unto Moses, when he had made an end of communing with him upon mount Sinai, two tables of testimony, tables of stone, written with the finger of God. Kings 8:9 There was nothing in the ark save the two tables of stone, which Moses put there at Horeb, when the Lord made a covenant with the children of Israel, when they came out of the land of Egypt. Jesus Christ talked to Moses on Mount Sinai. Jesus said the Israelites should build a tabernacle. A tabernacle is a place to learn about God. Jesus would come to the tabernacle. Jesus showed Moses what the tabernacle should look like. He told Moses how to build it. Jesus told Moses which men should build the tabernacle. Jesus blessed the men so they could do good work. The Israelites obeyed Jesus. They gave gold and silver for the tabernacle. They gave animal skins for the roof. The women made beautiful cloth for the walls. The Israelites built the tabernacle the way Jesus told them. The tabernacle was like a tent. It had a wall of curtains. There was a yard inside the wall. An altar for sacrifices was in the yard. A small building was in the yard. It was also like a tent. It had two rooms. A gold altar was in one room. A beautiful, big box was in the other room. It was called the ark of the covenant. The stones with the commandments written on them were kept in the ark of the covenant. Moses was happy because the Israelites obeyed Jesus. Moses blessed the people. He blessed the tabernacle. He blessed Aaron and his sons and gave them the priesthood. Jesus chose other men to help them. Aaron and his sons burned sacrifices for the people. The other men helped take care of the tabernacle. The tabernacle was a holy place like a temple. Jesus came there. The people went there to learn about God and to do his work. They made sacrifices there. Jesus put a cloud above the tabernacle in the day. He put a fire above the tabernacle at night. The fire and the cloud showed the Israelites that Jesus was there. When the cloud moved, the Israelites took down the tabernacle. They carried it with them in the wilderness. They followed the cloud. There was peace in the land of Israel. God said King Solomon should build a temple in Jerusalem. It would be the house of God. 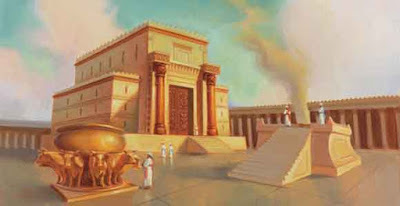 The ark of the covenant would be in the temple. 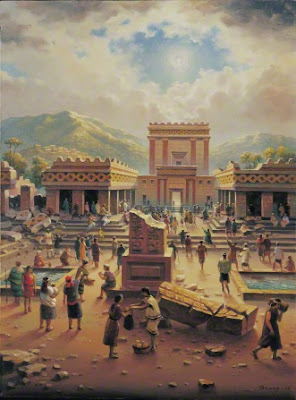 The people would not need the tabernacle anymore because they would have the temple. Thousands of people helped build the temple. It was made of stone and wood. Men brought the best wood from far away. They cut large stones for the walls of the temple. Another room had a pool filled with water. The pool was on the backs of twelve oxen. The oxen were made of brass. It took seven years to build the temple. At last it was finished. Then Solomon put beautiful gold and silver bowls in the temple. The priests brought the ark of the covenant from the tabernacle. They put the ark in the temple. The two stones with the commandments written on them were in the ark. The priests of Israel came to the temple. They sang songs and thanked God for the temple. The cloud that had been over the tabernacle filled the temple. The temple was the house of God. Solomon spoke to the Israelites. He told them to obey God’s commandments. Then Solomon prayed to God. He asked God to forgive the people when they had repented. Solomon made sacrifices to God. Fire from heaven came down to the altar. The fire burned the sacrifices. The people worshiped God. They thanked him for the temple. God spoke to Solomon. He said Solomon and the Israelites should be righteous. Then he would bless them forever. 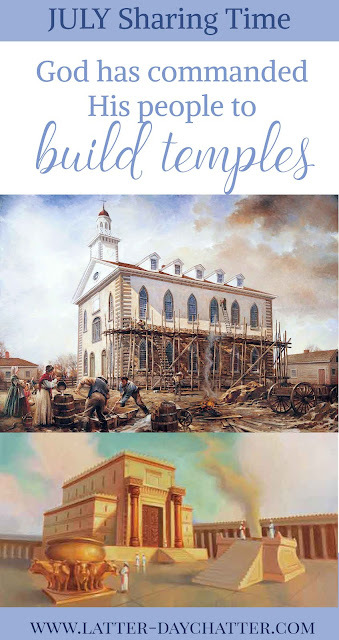 After Nephi and his family reached the promised they built a temple.The temple they built resembled the temple that King Solomon built. King Solomon's temple was the temple that Nephi and his family knew before they left Jerusalem. 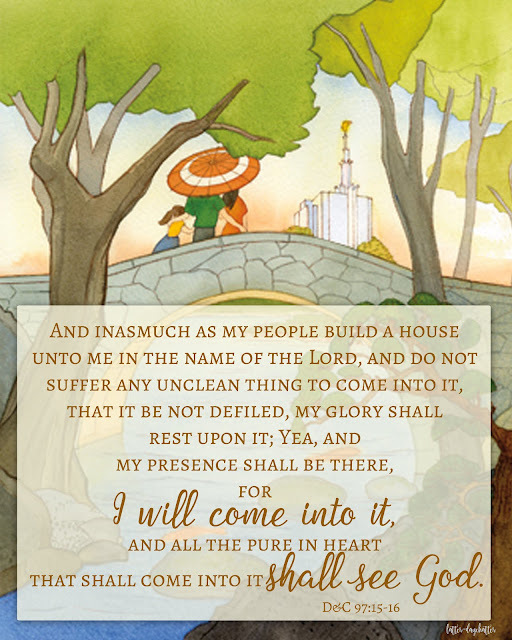 There were many blessings that the Nephites enjoyed because of the temple. King Benjamin's address from the tower so all could hear him and the Savior appeared to the Nephites who were gathered at the temple. That my covenant people may be gathered in one in that day when I shall come to my temple. And this I do for the salvation of my people. The Saints moved from Kirtland and the temple fell into the hands of another Church. Both modern and biblical temples were built under the direction of Jesus Christ but there is a difference between the two. 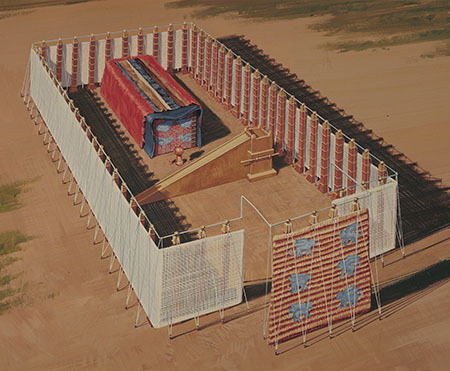 The law of Moses temples were operated by men born to the Aaronic or Levitical Priesthood and were led by a high priest, who was a literal descendant of Aaron. That high priest was the only person who entered the most sacred room on only one day a year—the Day of Atonement. It was just outside of the temple on an altar that sacrifices prescribed in the law of Moses were offered. Here's a really awesome video that is well worth the time to at least watch if not to share with your Primary. I love this scripture and wanted to share a poster for it. Why do we build temples? After all the ordinance work, because it is a place for the spirit to dwell, I just love to be there and pray of things that are troubling and really get an eye opening experience and help to face the troubles.